Heading to our favorite destination, Barbados, my friends and travel companions Jason, Marianne and Christine, were a little nervous about the trip. When the villa we’d stayed at for the past few years wasn’t available, we decided to try Villa BS CAS and hoped we had made the right decision. 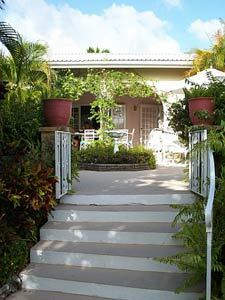 We had only to approach the beautifully landscaped, gated property to know that we had found a new favorite location. Villa BS CAS sits above Sunset Crest on the lush, lovely West Coast of the island. It's called the Gold Coast for a reason and we usually spend much of our time on this quieter, more residential side of the island. Villa BS CAS is a lovely 4 bedroom, one-level home situated on a gorgeously landscaped lot next door to the American Ambassador’s residence. Though we never feel unsafe in Barbados, the additional security detail next door was an added bonus. As we exited the taxi and headed up the pathway flanked on both sides by bougainvillea, we entered the first of what we considered three yard areas. We walked past the first, close to walk, shaded most of the day, and outfitted with a table, umbrella and chairs and gazed toward the second with a teardrop pool, chaise lounges, hammock, and enchanting Jacuzzi gazebo. Continuing toward the villa, we entered what would become our morning coffee patio, also equipped with a table, umbrella and chairs and surrounded by, at our count, at least 14 different kinds of flowers, trees and bushes. This led us to the covered, but open, dining and sitting room where we would end up doing most of our entertaining and where we enjoyed all of our meals at the villa. Here we were greeted by the smiling faces of Glendine and Wendy who made us feel right at home and showed us the details of the property. Inside, we found a spacious living room with a large television (which we seldom if ever use on vacation), plenty of comfortable couches and chairs, and a wireless Internet modem. On one side of the living room was the dining room – nice but too formal for us – and inside! (It’s an unwritten rule in our travel party that we only eat inside in the Caribbean in inclement weather or if there's absolutely no choice.) The kitchen was big and bright and well equipped with everything we needed and enough glasses to cater a wedding. On the opposite side of the living room were the bedrooms – two very large rooms with ensuite baths were bookends to two spacious adjoining rooms which shared a bath. 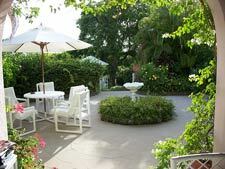 All of the rooms offered enormous closets, air conditioning, and tasteful furnishings. 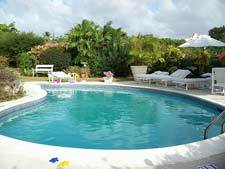 We're really not very demanding villa guests and prefer that the staff feel comfortable with us and attend to the basics that it’s a treat to be on vacation and not have to do (laundry and dishes mostly). Glendine couldn’t have been nicer or more efficient. When we’re on the island, we love to eat local favorites like flying fish, macaroni pie, breadfruit, plantain, and buljol. Wendy happily whipped up anything we asked – delicious! We also owe thanks to Patrick who worked so hard to keep the yard of spectacular blooms looking flawless every day. All three had the much appreciated ability to be right there when you needed them but never intrusive in any way. Our normal routine when in the islands, and Barbados in particular, is to get up, have coffee and a bite to eat, pack up, and head to the beach. Our regular destinations are the beautiful stretches of sand at Mullins or Payne’s Bay (both on the West Coast), and Accra (on the South Coast) though the ambience of each changes with each trip and it's seldom the same favorite two trips in a row. This time, however, we had a hard time dragging ourselves away from the pool at Villa BS CAS and spent many days lounging in the yard and dipping in the pool. We all really enjoyed the lazy, vacation-induced coma it allowed us all to fall into. With all the amenities of the villa an arms-reach away and no sand to shake out of our bathing suits at the end of the day, it was an indulgence we couldn't resist. Instead of traipsing home to get out of wet suits and shower off the salt water at the end of the day, a Jacuzzi and cocktail in the late afternoon after a day at the villa left us plenty of time to leisurely shower and dress for a great night out to dinner.